One of the joyous pleasures of life is appearing in a place almost by chance and there is something fantastic going on. These past few days I've felt a little like The Doctor, in that respect. We travelled to Antwerp on our grand tour of the Low Countries not really knowing what we would find. We were supposed to cycle from Rotterdam but I had knackered my knee so we caught the train. Walking through the crowded streets of the city we noticed a very large crowd had congregated around some machinery that seemed to be making snoring and tweeting noises. As got closer and crowd got denser we realized it was the collapsed heap of a gigantic puppet who, appeared to be sleeping. And after the busy day she'd had who could blame her. The "little giantess" (Kleine Reuzin) is the construction of a French street theatre company called Royal de Luxe, and she has been visiting Antwerp for a few years. There is always a different story, which the public have to be cunning to find out about. There are posters and fliers advertising something will be happening from 20 -22 August, but not what or where. During those days, 3 camp little green caravans set up around the town telling people where the next part of the story would happen. 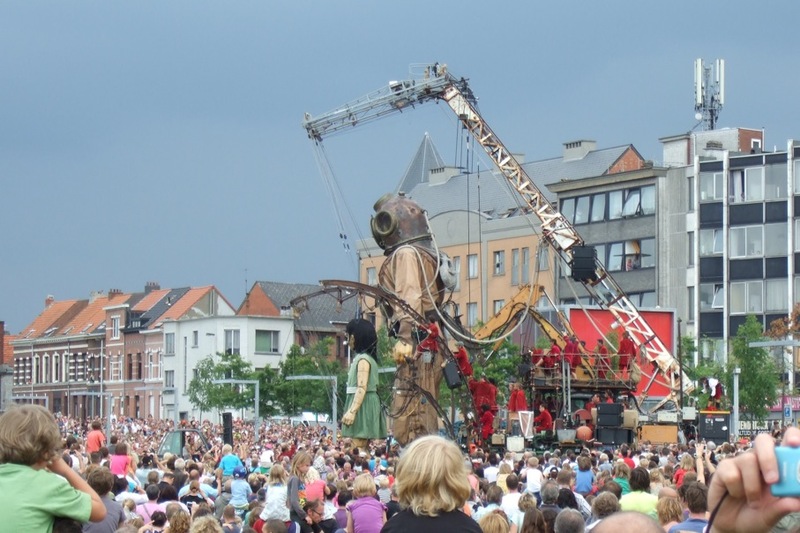 This year the spectacular was called "De duiker, zijn hand en de kleine reuzin" or "the diver, his hand and the little giantess". The puppets are beautifully crafted and quite colossal in scale. Fortunately they are not cutesy looking. They convey the effect of things lovingly created but then left to look aged and deliberately shabby. It is delightfully subtle because it makes you believe for a moment these are real mythical giants with an involved back-story. They are mechanically operated by what the Royal de Luxe refer to as "Lilliputians" because they look so tiny compared to the characters. They are even dressed in late 17th century livery frock coats, as they haul blocks and tackles around to animate the 2 avatars. A little reminiscent of the Lilliputians in gulliver's travels who wrestled the eponymous hero down with ropes, these Lilliputians keep the giants alive by working the ropes. The heads move with some independence to the controlling motions of the lilliputians, looking from side to side, blinking, and smiling, which reinforces the notion that we are witnessing the awakening of real giants. This year 10s of thousands of people flocked to see the little giantess (who stands at 5.5m) help the diver (who is 7.5m tall) to find his missing hand. Once the diver found his hand back the two of them had a picnic in the park and then a siesta, after which they have a celebratory march to the dock and sail off into the sunset. Their march was accompanied by a live rock band, giant pair cymbals which clashed a little too persistently, shooting out confetti and postcards from the diver, and a model of the diver's ship rocking about in a malestrom. It was an unbelievable and terrific sight. Well done Antwerp for having the gumption to put on such a thrilling piece of street art. Update: You can view all of my pictures of the Giants on my Picasa page.